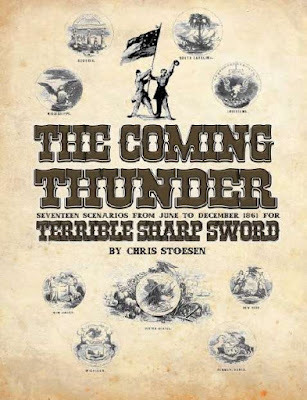 The Coming Thunder is a scenario book covering historical skirmishes from June to December of 1861 during the American Civil War. All of these occur in a relatively small area of northern Virginia involving many of the same units. There are 17 scenarios plus a campaign background to use with the campaign generator that comes with the rules. The scenarios are all from the first year of the war as is the campaign generator. The campaign generator is focused on the "Battle of the Peach Orchard" in the Fall of 1861. The battle was no one battle but a series of linked skirmishes that occurred across numerous orchards of peaches in Northern Virginia. It is an entertaining piece of history as the skirmishes had basically come to a stop once the troops had picked the peach trees clean of fruit. These scenarios are written for the TooFatLardies rules Terrible Sharp Sword. However, they are perfectly compatible with other skirmish rule sets such as Brother Against Brother.